If you or any of your clients have chosen martial arts training as your hobby- congratulations! This is a very rewarding path, both physically and mentally. It gives you all the components of fitness wrapped up into an activity that can be practiced three to four times a week. One key to reaping all the rewards of something as beneficial as martial arts training is to develop and use strategies to train long term . . . because training sessions should be enjoyed, regardless of how hard they seem. Constant overtraining and long-term enjoyment are not a winning combination. The purpose of this article is to give the recreational martial artist simple strategies to continue to train and thrive long-term. Let’s address the pink elephant in the room immediately and set some expectations. You can only train as hard as you are able to recover from each session. This means that after challenging training sessions, it is not enough to just get back to the mats, but rather to get back to the mats in such a way that allows you to perform as close to your “best” as possible with minimal restrictions. Sleep – Sleep deprivation can, among other things, contribute to an abnormally elevated level of the stress hormone, cortisol. Normal cortisol levels associated with the stress response are necessary for proper functioning. It is when this hormone is chronically elevated that is has adverse effects on the immune system, places the body in a catabolic state and slows down recovery time. A lack of sleep can also have negative effects on your mood and decision-making abilities. These are both important for your regular life as well as how you perform successfully on the mat. How much sleep? That is an individual time-frame and the answer goes something like this: Figure out how many hours of sleep you need to wake up feeling rested without your alarm clock. That is the amount of sleep needed for you. Are you eating to your individual caloric and nutrient profile needs? Are you getting the proper fluid intake? Do your food choices make you feel better or worse physically? Soft tissue work – Whether you grab your foam roller and perform SMR at home or you work with a massage therapist, soft tissue work is important for removing myofascial adhesions to give your musculoskeletal system a reset. Whole textbooks have been written about each of these points individually. The point here is that you need to be proactive to ensure your longevity in martial arts training. This was supposed to be the fun stuff, but we want to tackle this before loading any faulty movement patterns. One thing that keeps martial artists training long-term is dedication to a proper strength training program. It’s really tempting to go out and try to reproduce one’s martial arts skills into a “sport-training” program. One challenge that may occur with this programming is that we are creatures of habit and that means we stick to what we like. This includes doing only the exercises we like. So a good first step is to develop your integrated training program based on your assessment. Overhead Squat Assessment (OHSA) – This is a dynamic movement assessment that will give insight into the flexibility and stability of your lower and upper extremities, as well as the lumbopelvic hip complex. It is the information from this very simple assessment that will become the staple of your movement prep or warm-up regimen. Single-Leg Squat (SLS) – This is a great assessment to get feedback on which extremity and consequently which movement subsystem is driving your compensations. Martial artist, especially those who spar often, have a dominant side – not a problem. However, spending too much time performing athletic activities on the same side may lead to challenges in the future. Transitional Shoulder Assessments – Shoulder health is vital to the martial artists. Without it, it becomes difficult to deliver effective strikes as well as grip moves if you’re a grappler. Do you have the flexibility to kick to the level of your head on both sides without compensating elsewhere? Do you have the strength and endurance to successfully practice with your partner? 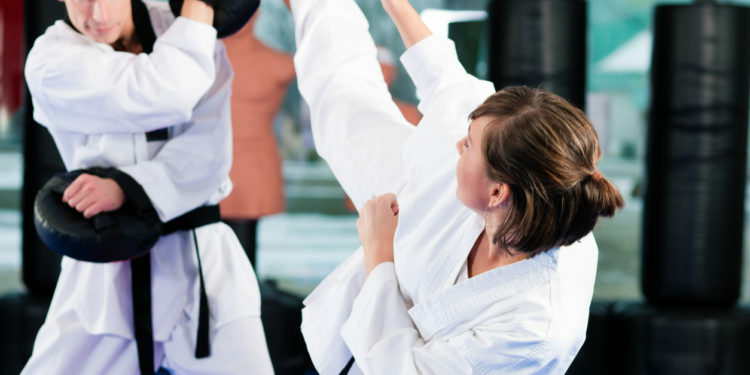 Yes, martial arts training relies heavily upon timing and leverage but when those attributes are equal, other components, such as strength and endurance, become factors for a successful practice. Do you have the additional cardiovascular conditioning to perform your sport-specific movements for the appropriate duration? Training in the martial arts offers a wide range of techniques, but since we are creatures of habit and convenience, we tend to stick to the techniques that complement our attributes. We often miss out on developing qualities that would ultimately enhance the training experience. Hopefully, it is starting to become clear that your assessments are going to drive your programming. Once you understand what needs to be addressed based on your dynamic movement assessments, general fitness assessments, and your goals, let this serve as the base of your training. While every art has some differences regarding specific skills, the following will offer ideas for exercise selection and progressions that may be used based on needs and aptitude. It should be noted that you’ll also want to manipulate the acute variables, as per the OPT™ model, to expose your body to different training volumes, intensities, and tempos. In addition to the acute variables, make sure that you also explore multiplanar movements and unilateral training to “mimic” what you’d experience while practicing martial arts. It is important for the martial artist to understand how to transfer force from the lower extremities through the core to the upper extremities. Without this ability it becomes difficult to efficiently perform many of the skills. Get-Up with a Kettlebell – This movement, done properly will challenge you in multiple planes of motion, forcing you to stabilize the shoulder while moving from the floor to a standing position. In-line Split Stance Scaption – This drill is a stabilization exercise and will address your ability to maintain balance and a neutral lumbar spine while lifting weights within the scapular plane. In-line Split Stance Row – This is like the previous exercise but now we are training more of the posterior muscles in the shoulder complex. Kettlebell Clean and Press – The movement requires an explosive hip extension, the ability to decelerate the bell onto a stable base and finally driving the bells upward until they are overhead. This requires flexibility in the lats as well as thoracic spine mobility. The legs are, of course, necessary to deliver powerful kicks, execute takedowns and throws, as well as performing jumps. Where applicable, it is important to train the legs using multiple loading parameters and moving through different planes of motion. Multi-planar Lunges – Moves don’t happen only in the sagittal plane. Explore lunges moving in the frontal and transverse planes as well. Deadlifts – Strong, stable hips and spinal erectors are especially important in grappling arts. Start out with single leg deadlift movements and progress to higher intensity deadlifts, provided they are done safely. The martial artist needs to express strength with various pushing and pulling actions required for defensive movements and throws. Pushups – This exercise develops great upper body strength and trunk stability and is an entry level technique for more intense chest-centric movements. You can get a lot out of the basic pushup, and once you’ve mastered the basics, try doing them with suspension trainers and give single-arm pushups a shot. Dumbbell (DB) Chest Presses – This open-chain exercise is a good choice because the upper body extremities are working independently to stabilize dumbbells. Pullup and Row Progressions – The ability to grip and pull your opponent is a necessary skill, especially for the grappling arts. Performing pullups and rows support that activity. Cable Chop Progressions – Start this progression in a tall kneeling position and perform with minimal spinal movement. Eventually progress to standing. Rotational Medicine Ball Throws – This is a very versatile drill and can be done just about anywhere with a compliant partner or a durable wall. This drill develops the speed of rotation in your punches, throws and kicks. Mace/ Clubbell – This is a “new” old tool that can be traced to antiquity. These implements, specifically the mace, were used to train both warriors and wrestlers. These suggestions aren’t exhaustive and only represent a small sample of what is possible in a strength training program limited only by your imagination and availability of equipment. Just make sure to manipulate the variables of training to give the body different stimuli. Develop a base with the long-term system by training 30 minutes at 60-75% of maximal heart rate (MHR). Running, biking and swimming are good choice. Training the intermittent system with your sport specific drills (e.g., bag work, timed ground agility drills, drill specific sparring scenarios with your training partner). Sometimes, especially for the aging martial artist, it isn’t advisable to hit the dojo because your body is giving you other feedback. During times such as this, it is important to add visualization to your training plan. This practice can give you some of the benefits of being on the mat without the drawback of overtraining. Choose a few scenarios that you’d like work on and put your imagination to work for you. A key here is to visualize being successful and make your experience as sensory rich as possible right down to the sights, scents and sounds of in-person training. If the goal is to become a stronger martial artist, you must train in your art and hopefully cross-train in another one to become well-rounded in the applications. The goal of this training approach is to take you out of repetitive patterns and create a base of stability. Once you’ve done that, then you can add strength and power. Think more about general physical preparation. Simply, get out of the repetitive patterns of your art and then get stronger. When using general physical preparation (GPP) training, or any training for that matter, you’re only using the minimum effective dose. Do only as much as you need to get the adaptation that you want. The sport specific training will happen on the mat or in the ring. This is where time is spent performing repetitions of specialized balance, SAQ, and strength training drills that are wrapped up into the various throws, kicks and punches. While no plan is fool-proof, if you apply the strategies of recovery, strength training and visualization to your martial arts training, you will have added some of the necessary conditions for longevity.